Bunčić, Daniel. 2016. Biscriptality: A sociolinguistic typology. Edited by Daniel Bunčić, Sandra L. Lippert, Achim Rabus. With contributions by Anastasia Antipova, Carmen Brandt, Ekaterina Kislova, Henning Klöter, Alexandra von Lieven, Sandra L. Lippert, Helma Pasch, Achim Rabus, Jürgen Spitzmüller, Constanze Weth. On behalf of the Heidelberg Academy of Sciences, the State Academy of Baden-Württemberg. Heidelberg: Winter (Akademiekonferenzen, 24). 425 pages. Softcover: 23.5 cm × 15.5 cm (9¼″ × 6″), with 128 black-and-white illustrations, ISBN 978-3-8253-6625-4. E-book: with 57 black-and-white and 71 colour illustrations, ISBN 978-3-8253-7619-2. Serbs write their language in Cyrillic or Latin letters in seemingly random distribution. Hindi-Urdu is written in Nāgarī by Hindus and in the Arabic script by Muslims. In medieval Scandinavia the Latin alphabet, ink and parchment were used for texts ‘for eternity’, whereas ephemeral messages were carved into wood in runes. The Occitan language has two competing orthographies. German texts were set either in blackletter or in roman type between 1749 and 1941. In Ancient Egypt the distribution of hieroglyphs, hieratic and demotic was much more complex than commonly assumed. Chinese is written with traditional and simplified characters in different countries. This collective monograph, which includes contributions from eleven specialists in different philological areas (Egyptology, African, Chinese, German, Romance, Slavic and South Asian studies), for the first time develops a coherent typological model on the basis of sociolinguistic and graphematic criteria to describe and classify these and many other linguistic situations in which two or more writing systems are used simultaneously for one and the same language. 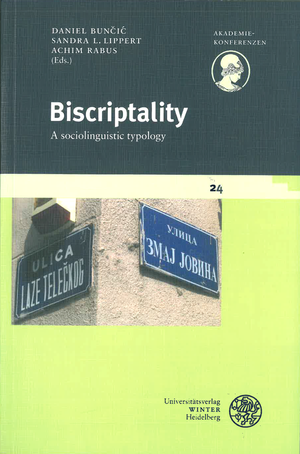 Order softcover edition from the publisher (€ 52.00). Order e-book (pdf with coloured illustrations, single license) from the publisher (€ 52.00). Order e-book with a license for institutions from ebrary, MyiLibrary or ciando. Buy the book at your local book shop or from buchhandel.de (€ 52.00), osiander.de (€ 52.00), ebook.de (€ 52.00), ZVAB, buch.ch (Fr. 64.90), manz.at (€ 53.50), libristo.pl (zł 261.46), bookcity.pl (zł 264.13), bookline.hu (Ft 17,489), cdon.dk (kr 451), adlibris.com (Sweden) (kr 488), adlibris.com (Norway) (kr 438), adlibris.com (Finland) (€ 47.50) wantitall.co.za (R 2,072), Barnes & Noble (USA), amazon.com ($ 65.00), amazon.co.uk (£ 45.60), amazon.fr (€ 60.95), amazon.it (€ 50.54), amazon.es (€ 50.54), amazon.co.jp (¥ 7509), amazon.com.br (R$ 342.45), amazon.ca, russia-amazon.ru or amazon.de (€ 52.00). The publication was sponsored by the Heidelberg Academy of Sciences and Humanities.